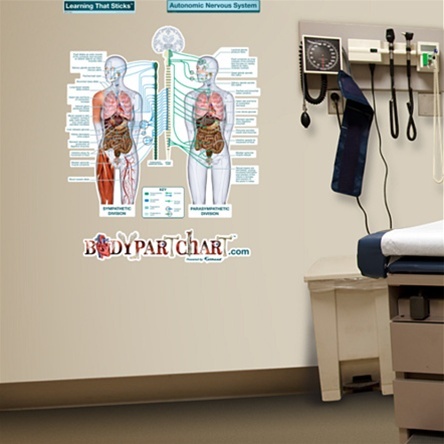 Easy to apply, movable, and dry-erasable, these highly accurate, patient appropriate anatomical images make explanations more visual. Made of high quality vinyl with a self adhesive backing, installation is simplified. The vivid detail and high definition colors deliver a three dimensional look and feel. Being oversized and free form helps to eliminate confusion and creates an environment for learning. Patients value conversation time with their health care providers. BodyPartChart images are perfect for reporting findings, consultations, and procedural explanations. They will empower your patients and give you the tools to instill confidence and trust. People of all ages benefit from visual learning. These bold, over sized images can adorn any exam room, waiting area, lab area, or class room setting and will inspire and educate. Please note: These anatomy charts are made-to-order and may take up to 48 business hours to ship out. Please keep this in mind if you select expedited shipping for these items. With Standard Ground shipping, you should receive this item within 5-7 business days.